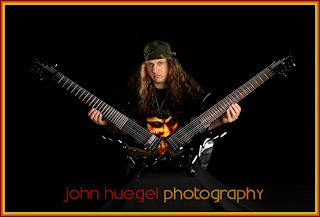 Last weekend I had the honor of working with Sonny Lombardozzi, an Erie-based guitarist known around the world as The World’s Most Brutal Shredder. This first image was shot with four lights on a black background. You can clearly see the guitar which stands out well with the front and backlighting. Sonny is pictured here with the official Saw Double 8-string guitar. Featuring fully scalloped fret boards, 4 808 EMG pickups and two pro Kahler trems, this 30-pound instrument is an amazing guitar…or guitars! This next image features both the guitar and a Revolt Barbarian guitar amp head. Shot in high-key with a white background, the items stand out more clearly than on black. 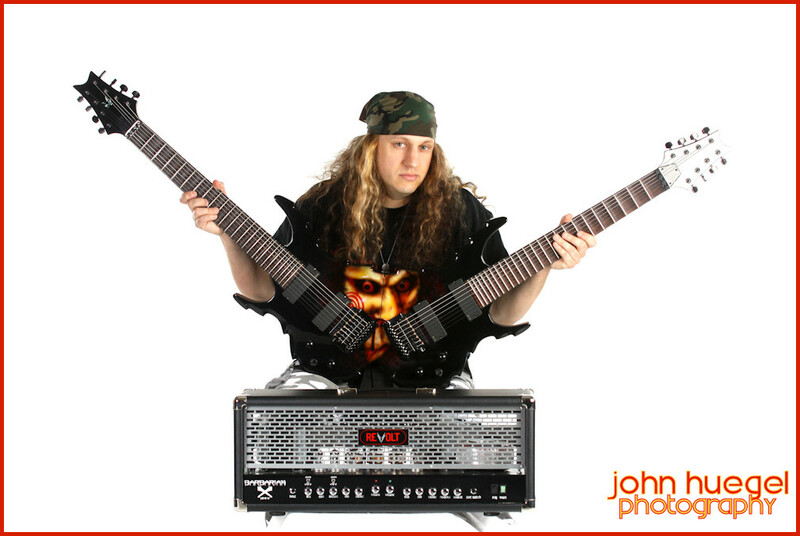 I worked with Sonny on several promotional images for some of his sponsors, including Spider energy drinks, EMG pickups and Revolt amp heads. Look for some of these images soon on Sonny’s web site, his sponsors’ sites, and perhaps in print and other interesting forms! Thanks Sonny for letting me feature a couple of your images! This entry was posted in double guitar, guitar by admin. Bookmark the permalink.